This month has been a great month for Facebook users, as they got a plethora of new features on Facebook. Facebook introduced the Story feature in Messenger. Then it incorporated the same feature in the app or the main website of Facebook. Now another new feature that has hit the Messenger application is the Reactions. Users can now give reactions while chatting on Messenger. 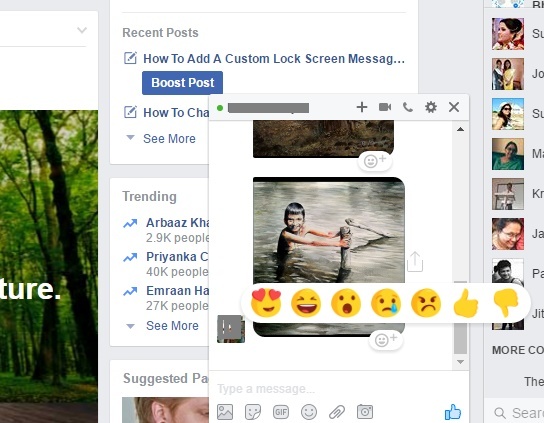 So now, the Reactions feature is not limited to comments only. Users can use them to react to a particular line written in the chat. Suppose you are chatting with your friend and you want to react to a joke or a comment written by your friend. Previously you expressed your emotions by inserting meaningful stickers or emoticons. But now you can directly react to a chat line. The process is very simple. Whenever your friend types a message and you receive it, the message will be accompanied by a face icon. Tap on the icon and a menu will appear that will show seven reactions. The reactions are love, laugh, surprise, cry, anger, like and dislike. Unlike the comment Reactions, the dislike button has made its way to the Messenger Reactions list. Since chats are mostly one to one correspondence, hence a dislike button will not be of much harm. The new feature has been added to the desktop version, the Android App and iOS. The new version of Messenger will automatically include the feature to your mobile or computer. The Reaction feature is small, handy and fun to use. You can also use the new feature if you hve the latest version of the app installed in your computer. YouTube Bookmarker: How To Add Bookmarks To A YouTube Video in Chrome?